At Bloomberg Law, Kimberly Robinson reports that after Wednesday’s oral argument in Kisor v. Wilkie, in which the Supreme Court was asked to reconsider precedents that require courts to defer to a federal agency’s reasonable interpretation of its own regulations, the “justices appear primed to curtail administrative agencies’ regulatory power, but the court’s ultimate decision could lead to a much bigger conservative target: overturning the oft-maligned Chevron doctrine.” At The Daily Signal, Elizabeth Slattery argues that “it’s time for the court to correct its mistake and make clear that judges—not agency officials —say what the law is.” William Goren analyzes the argument at Understanding the ADA. 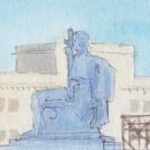 At Balkinization, Neil Siegel reacts to the description of the Supreme Court’s ruling upholding the Affordable Care Act’s individual mandate in Joan Biskupic’s recent biography of Chief Justice John Roberts. Is Graffiti Constitutionally Protected Free Speech?